Blue Rider Press, 9780399573811, 432pp. The night that Jane and Bonnie meet on a college campus sets them on paths forever entwined. Bonnie, the wild and experimental one, always up for anything, has spent the past two decades bouncing between ill-fated relationships, while Jane’s seemingly perfect life, perfect husband, and perfect children have all but materialized out of a fantasy. But these appearances contradict the quiet, inescapable doubt Jane feels about her life. One night, in the middle of her own Christmas party, she steps outside into the snow, removes her clothing and shoes, and lies down in the backyard. When she is discovered, nothing is the same for anyone. As Jane begins to have visions and retreat into a private inner world, Bonnie finds herself drawn inevitably into an affair with Jane’s husband. Thompson’s mastery of complex emotion begets a novel of desire and the nature of love—who we love, how we’re loved, and, most important, that we reach urgently and always for a higher love, regardless of our circumstances. 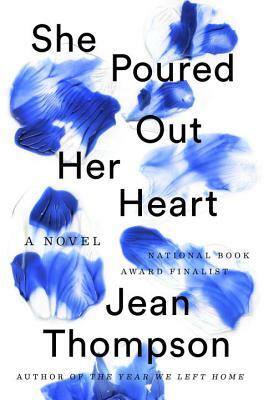 She Poured Out Her Heart is a finely wrought, haunting story of female friendship and deception, and the distance in between. Jean Thompson is the author of six novels, among them The Humanity Project and The Year We Left Home, and six story collections, including Who Do You Love (a National Book Award finalist) and, most recently, The Witch. She lives in Urbana, Illinois.